Aerial view of Skagway, Alaska. The port of Skagway is a popular stop for cruise ships, and the tourist trade is a big part of the business of Skagway. The White Pass and Yukon Route narrow gauge railroad, part of the area's mining past, is now in operation purely for the tourist trade and runs throughout the summer months. Skagway is also part of the setting for Jack London's book The Call of the Wild, Will Hobbs's book Jason's Gold, and for Joe Haldeman's novel, Guardian. The John Wayne film North to Alaska (1960) was filmed nearby. In July 1923, President Warren G. Harding visited Skagway while on his historic tour through Alaska. Harding was the first President of the United States to travel and tour Alaska while in office. The Canol pipeline was extended to Skagway in the 1940's where oil was shipped in by sea and pumped north. Skagway is located in a narrow glaciated valley at the head of the Taiya Inlet, the north end of the Lynn Canal, which is the most northern fjord on the Inside Passage on the south coast of Alaska. It is in the Alaska panhandle 90 miles northwest of Juneau, Alaska's capital city. Skagway has a humid continental cool-summer climate ( Köppen Dsb). It is in the rain shadow of the coastal mountains, though not as pronounced as the rain shadow in Southcentral Alaska, in the valley of the Susitna River, this still allows it to receive only half as much precipitation as Juneau and only a sixth as much as Yakutat. Although winters are too cold for the classification, precipitation patterns resemble a mediterranean climate due to the dry summers. The highest temperature recorded in Skagway is 92 °F or 33.3 °C in three separate years, most recently in 1975, and the lowest temperature recorded is −24 °F or −31.1 °C on February 2, 1947. Skagway first appeared on the 1900 U.S. Census, having incorporated as a city that same year. It was the 2nd largest city in Alaska, behind fellow Gold Rush boomtown Nome. It reported 3,117 residents, of which 2,845 were White, 113 were Native Americans, 98 were Black and 61 were Asian. It rapidly declined to 872 residents by 1910, falling to the 8th largest city. It reported 802 Whites, 61 Native Americans and 9 Others. It would be 90 years (until 2000) before it would almost reach that population again (862). It fell to 15th largest community overall in 1920. By 1930, it bottomed out at 492 residents, although it rose to 13th largest in the state. In 1940, it fell to 16th. By 1950, 19th. 1960, it tied for 29th place (16th largest incorporated). In 1970, it dropped to 45th (24th largest incorporated). In 1980, it rose to 35th place. In 1990, it fell to 53rd place. In 2000, it was at 60th place overall (29th largest incorporated). In 2007, with the creation of the Skagway Municipality out of Skagway-Hoonah-Angoon, it ceased to be an incorporated city and became a census-designated place (CDP). As of 2010, it is the 71st largest community in Alaska. As of the census  of 2000, there were 862 people, 401 households, and 214 families residing in the city. The population density was 1.9 people per square mile (0.7/km2). There were 502 housing units at an average density of 1.1 per square mile (0.4/km2). The racial makeup of the city was 92.34% White, 3.02% Native American, 0.58% Asian, 0.23% Pacific Islander, 0.81% from other races, and 3.02% from two or more races. 2.09% of the population were Hispanic or Latino of any race. There were 401 households out of which 23.2% had children under the age of 18 living with them, 46.9% were married couples living together, 4.7% had a female householder with no husband present, and 46.4% were non-families. 36.2% of all households were made up of individuals and 6.7% had someone living alone who was 65 years of age or older. The average household size was 2.15 and the average family size was 2.81. In the city the population was distributed with 20.5% under the age of 18, 5.2% from 18 to 24, 34.6% from 25 to 44, 31.2% from 45 to 64, and 8.5% who were 65 years of age or older. The median age was 40 years old. For every 100 females, there were 109.2 males. For every 100 females age 18 and over, there were 112.7 males. The median income for a household in the city was $49,375, and the median income for a family was $62,188. Males had a median income of $44,583 versus $30,956 for females. The per capita income for the city was $27,700. About 1.0% of families and 3.7% of the population were below the poverty line, including none of those under age 18 and 4.5% of those age 65 or over. Wooden building in the historic center of Skagway. Broadway Avenue, in the summer during the tourist season (2017). There are visitors to the Klondike Gold Rush National Historical Park and White Pass and Chilkoot Trails. 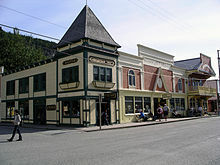 Skagway has a historical district of about 100 buildings from the gold rush era. It receives about a million tourists annually,[ citation needed] most of whom (about three quarters) come on cruise ships. The White Pass and Yukon Route operates its narrow-gauge train around Skagway during the summer months, primarily for tourists. The WPYR also ships copper ore from the interior. The port of Skagway provides sea access to cruise ships and ferries. The White Pass and Yukon Route is a railway that formerly linked Whitehorse, Yukon in Canada to Skagway, the railway's southernmost terminus. Today, trains travel several times a week from May through September from Skagway to the small community of Carcross, approximately 45 miles south/southwest of Whitehorse. There, passengers (mostly tourists) can make connections via bus to Whitehorse. The Skagway Airport receives service from two bush carriers: Wings of Alaska, and Air Excursions. Skagway is served by its local semimonthly newspaper, The Skagway News, as well as regional public radio station KHNS, which has its principal studios in nearby Haines but also has studios and programs based in Skagway. Juneau radio station KINY operates a translator in Skagway which serves the entire town. Skagway also receives copies of the free regional newspaper Capital City Weekly. In the Three Stooges short In the Sweet Pie and Pie, Skagway receives a humorous mention: "Edam Neckties, with three convenient locations: Skagway, Alaska; Little America; and Pago Pago." Skagway is featured in the 1955 Western The Far Country, directed by Anthony Mann. Skagway is a town featured in the computer game The Yukon Trail. In an episode of Homeland Security USA, the border crossing in Skagway was featured as being the least-used crossing in the United States. Chief Inspector Fenwick often dryly referred to nearby "big city" "Skagway" when sending his mounty, Dudley Do-Right, to capture the show's evil nemesis, Snidely Whiplash. Skagway is served by Dahl Memorial Clinic, the only primary health clinic in the area. The facility is usually staffed by 3 Advanced Nurse Practitioners and 3 Medical Assistants and is open Monday through Friday year-round with limited Saturday hours during summer citation needed. The clinic also operates after hours in emergency situations. The borough is also served 24/7 by local EMS. Individuals in need of dire medical attention are transported by air via helicopter or air ambulance to Bartlett Regional Hospital in Juneau (an approximately 45 minute flight). Whitehorse General Hospital in Whitehorse, Yukon is the nearest hospital to Skagway that is accessible by road (an approximately 2 hour drive). ^ "Municipality of Skagway Borough". skagway.org. Retrieved 21 March 2019. ^ a b "U.S. Census Bureau QuickFacts". United States Census Bureau. Retrieved September 29, 2018. ^ a b Thornton, Thomas F. (2004). Klondike Gold Rush National Historic Park Ethnographic Overview and Assessment. U.S. Dept. of Interior. , at page 53 (“Most [1995-2002 Tlingit-speaking informants] agreed that the name [Shԍagéi] refers to the effect of the strong north wind on the waters of Lynn Canal, which generates rugged seas and ‘wrinkled up’ waves.”). ^ Emmons, George T. (unpublished, 1916). History of Tlingit Tribes and Clans. B.C. Archives, reproduced in, Thornton (2004). Klondike Gold Rush National Historic Park Ethnographic Overview and Assessment. , at page 19 (“[S]he was simply called Skagway [‘the beautiful one’].”). ^ See, Edwards, Keri (2009). Dictionary of Tlingit (PDF). Sealaska Heritage Institute. p. 107 (This verb is used to describe a beautiful woman). ISBN 978-0-9825786-6-7. Retrieved 2015-09-14. . The gerund was created by omitting the verb classifier “-l-,” thus rendering a noun. See, Id., at pp. 29-30 (Every Tlingit verb must have a classifier). ^ Krause, Aurel, and Arthur Krause (1993). To the Chukchi Peninsula and to the Tlingit Indians 1881/1882. University of Alaska Press. ISBN 978-0-912006-66-6. CS1 maint: Multiple names: authors list ( link), at pp. 195 (“two bays on our right” [1st = Skagway]), 197-98 (“Kanagu, the stone woman who lives in the first of the above-mentioned bays … is sending one snowstorm after another.”), 230 (“22. [Kanagu is a] mythical woman who is supposed to have turned to stone and unleashes winds when angry; the rock is in the Taiya Valley [sic, ‘Valley’ should be ‘Inlet’].”), 158 (“The god or goddess [Kanagu, note 22], the personified river that empties into the Dejah Valley [sic, ‘Valley’ should be ‘Inlet’]”), 120 and 202 (river name = “Schkaguḗ”); Emmons (1916). History of Tlingit Tribes and Clans, reproduced in, Thornton (2004). Klondike Gold Rush National Historic Park Ethnographic Overview and Assessment. , at page 19 (Skagway is reportedly derived from the following legend: “[T]he rock wall opened and [Skagway] disappeared forever. But when the North wind blows down from the White Pass, … it was believed to be the breath of her spirit”). ^ “Ben” Moore stated that Skagway "is, of course, an Indian name the meaning of which would take too long to explain in detail". Moore, J. Bernard (1997). 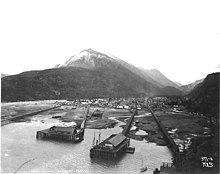 Skagway in Days Primeval: The Writings of J. Bernard Moore, 1886-1904. Lynn Canal Publishing. ISBN 0-945284-06-3. , pp. 96-97 (August 2, 1904, Skagway Speech). Ben and his father founded Skagway, Ben’s wife was a Tlingit Indian, and he conducted trade with the Tlingits. The Tlingits apparently explained to him the “long ... detail[ed]” meaning of Skagway. ^ Arthur Krause had reported that “Kanagoo … lives in [Skagway] bay.” Krause and Krause (1993). To the Chukchi Peninsula and to the Tlingit Indians. , at pp. 195, 197-98. Face Mountain’s Tlingit name is Kanagoo Yahaayí. Thornton (2012). Haa Léelk'w Hás Aaní Saax'ú (PDF). pp. 52–53. Retrieved 2017-10-16. Yahaayí is an inalienable noun, which may mean the soul of the noun that precedes it, or the image of the noun that precedes it. Edwards (2009). Dictionary of Tlingit (PDF). pp. 317, 406, 460. Retrieved 2015-09-14. Face Mountain is a little of each. ^ Skaguay News, summer edition, 2008, pg. 16. ^ "Skagway Alaska". Alaska Trekker. Retrieved July 8, 2018. ^ "Skagway Spectacular Sightseeing Tours, Skagway Tours, Skagway Alaska Tours, Skagway Tour, Skagway Train Ride, White Pass, White Pass Railroad Train Ride, AK". southeasttours.com. Retrieved July 8, 2018. ^ "Jeff. Smiths Parlor Museum - Klondike Gold Rush National Historical Park (U.S. National Park Service)". nps.gov. Retrieved July 8, 2018. ^ "Skagway, Alaska ... Then & Now". Retrieved 2011-02-05. ^ "Warren G. Harding - Life Facts". C-SPAN. Archived from the original on July 8, 2000. Retrieved 18 September 2016. ^ "SKAGWAY 2, ALASKA (508528)". Weather Channel. October 2011. Retrieved 15 January 2010. 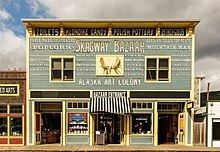 Wikimedia Commons has media related to Skagway, Alaska. Wikivoyage has a travel guide for Skagway. Wikisource has the text of the 1911 Encyclopædia Britannica article Skagway. University of Washington Libraries Digital Collections – Eric A. Hegg Photographs 736 photographs from 1897 to 1901 documenting the Klondike and Alaska gold rushes, including depictions of frontier life in Skagway and Nome, Alaska and Dawson, Yukon Territory. Keyword search on "Skagway".